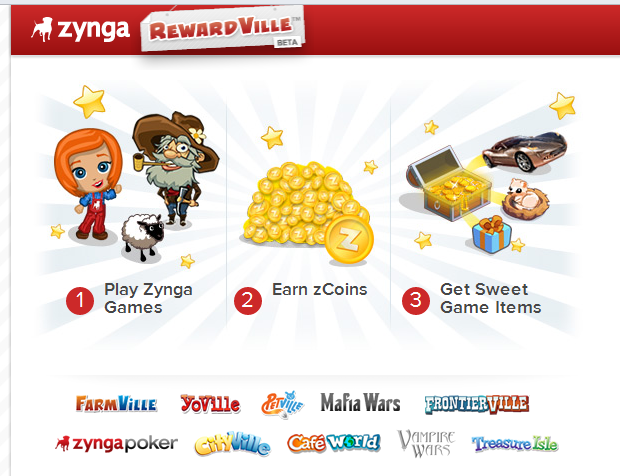 Zynga is preparing to launch RewardVille. 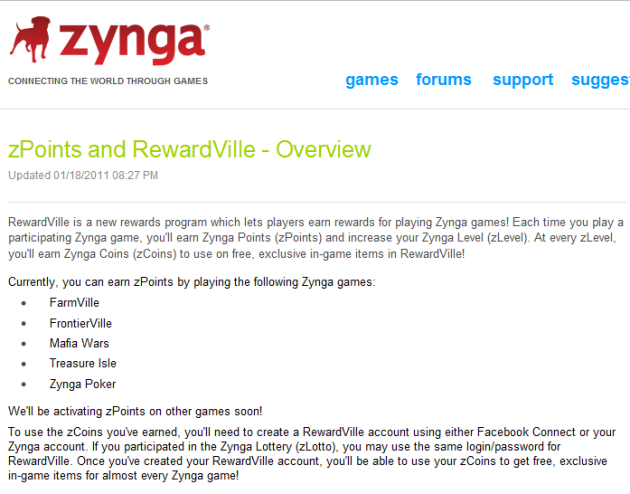 No, it’s not another ‘Ville’ game, but a rewards program apparently designed to let users earn rewards for playing Zynga games – which you can then use earn virtual currency, which you then use for purchasing in-game items. Earlier this month, domain industry vet and blogger Elliot J. Silver wondered whether it was Zynga who acquired the domain name RewardVille.com from its previous owner, for $4,500. Fusible.com then pretty much confirmed Zynga made the purchase, by uncovering that the social gaming juggernaut had registered a European trademark for ‘Rewardville’ last month. 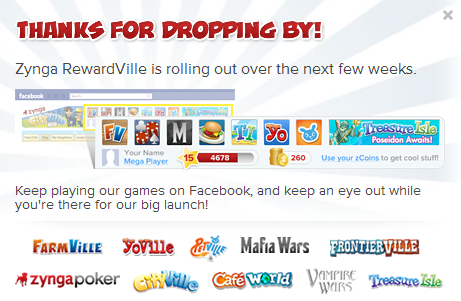 Fast forward to today, and Rewardville.com now resolves to a website that announces the rewards program in beta – the same website appears when you visit rewards.zynga.com, by the way. There’s a login screen, but you need to have a Zynga account (which, as far as I know, is usually created by connecting to your Facebook account) to get in. If you look at the menu at the bottom, you’ll see a link to a now deleted FAQ item about RewardVille, which is set to launch in the next few weeks, as you can tell from the screenshot above. 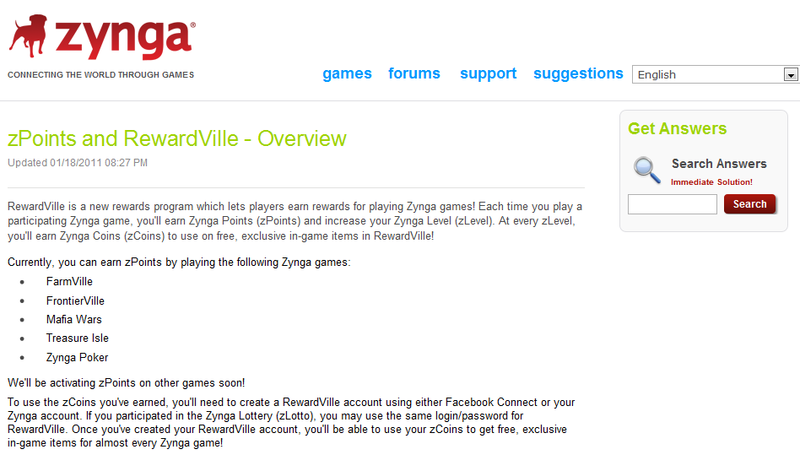 I did some digging, though, and found a blogger that cleverly took screenshots of several pages Zynga put up about RewardVille – the links all return errors at this point, however. I sincerely zHope that was as zConfusing for zYou as it was for zMe. Participating games include FarmVille, FrontierVille, Mafia Wars, Treasure Isle and Zynga Poker (and not hit game CityVille), although Zynga states that they’ll activate zPoints on other games in the near future. On another – now removed – page, Zynga specified that users automatically earn zPoints for playing Zynga games, but will need to register for a Zynga account in order to redeem zCoins. From the looks of it, players will be eligible to earn a maximum of 80 points per game per day, with a maximum of 300 points across the entire Zynga network each day. We’ve reached out to Zynga for more information, but didn’t hear back immediately. The company confirmed that the beta product will slowly roll out to a small group of users in the coming weeks.